I am a 91year old retired merchant marine, master radio electronics officer. My current interests include the restoration and building of violins. Sail boats and amateur radio have also given me much pleasure over the years. I served in WWII in the Army Air Corps 379th Bomber Squadron as a radio operator/navigator. I have been fortunate in life, to have the opportunity to travel extensively. Friends and family have often asked me to preserve stories about my experiences and interests. These pages are a gallery of some of the things I've seen and done. I'll be adding memoirs and stories as time and inspiration permit. I now live near a small town in the Florida panhandle. The name of the town is Mossy Head. My wife Lenore and I spend most winters in Key West, where my daughter lives. Before this, I lived in the Florida Keys, on the little island of No Name Key. We had no municipal electricity or water, but had all amenities provided by solar power, cistern water, and propane. Click here to see my property in mossy head; I have now moved into the newly renovated home on my farm. In 1944 I was assigned to the 8th Air Force's 379th Bomb Group,526th squadron in the European Theater and Participated in the Battle of the Ardennes as a radio operator/gunner on a B-17 based in Kimbolten England. A few years ago I sold my mobile home park located in Elkton, Missouri. Elkton is a small village that was once a stop on the Overland Stage and was also the home of Sally Rand, the famous fan dancer of the 30s. Today it is a quiet hideaway in the heart of the beautiful Ozarks and one of the least expensive places to live in the USA. 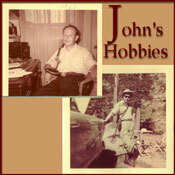 I've pursued a number of interests and hobbies in my life, including Amateur Radio, trout fishing and camping. Once I even rode in a rodeo in Beatty, Nevada. One of the most memorable events of my life was a 7 month cruise along the Mexican Riviera with my wife and daughter from San Diego California to the Florida Keys through the Panama Canal in our Kettenberg K-43 Sailing sloop, Lorelei.